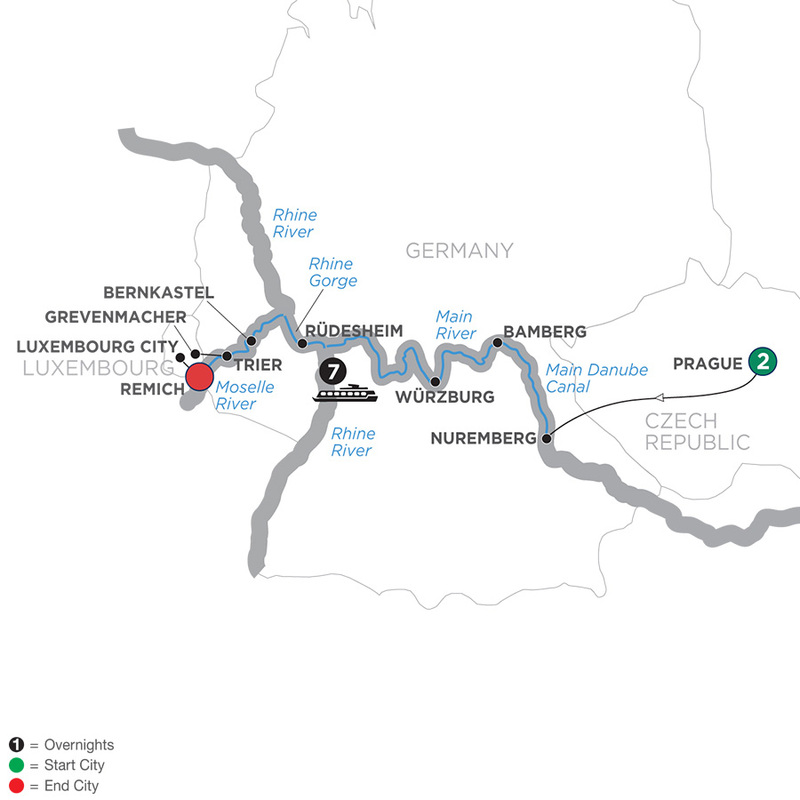 This splendid Central Europe river cruise introduces you to the magnificent Main, Rhine, and Moselle Rivers, as well as to the fascinating Main Danube Canal. Your vacation begins with two overnights, guided sightseeing, and a visit of the Hradcany Castle grounds in the “Golden City” of Prague. Also enjoy guided sightseeing in Bamberg, Würzburg, and Trier. Visit the Bishop’s Residenz in Würzburg, Siegfried’s Mechanical Musical Instrument Museum in pretty Rüdesheim, and enjoy a tasting of Moselle wines in Bernkastel. Other highlights: cruise through the dramatic Rhine Gorge, and travel by high-speed train to Paris. Your vacation ends in Paris with two overnights and guided sightseeing of the major sights. Day 1 Arrive in Prague, Czech Republic. Welcome to Prague, the capital of the Czech Republic. The city straddles the Vltava River with domes, cupolas, spires, and pinnacles highlighting its skyline.